Indicate by check mark whether the Registrant is a large accelerated filer, an accelerated filer, a non-accelerated filer, a smaller reporting company or an emerging growth company. See the definitions of "large accelerated filer," "accelerated filer," "smaller reporting company," and “emerging growth company” in Rule 12b-2 of the Exchange Act. As of June 30, 2018, the aggregate market value of the Registrants' common stock held by non-affiliates of the Registrants was $1.4 billion based on the closing sales price of $30.77 per share as reported on the New York Stock Exchange on June 29, 2018. As of December 31, 2018, the number of shares outstanding of Registrant's common stock was 56,615,352. Portions of part III of this Form 10-K are incorporated by reference from the Registrant's 2019 definitive proxy statement to be filed with the Securities and Exchange Commission no later than 120 days after the end of the Registrant's fiscal year. Certain statements in this Annual Report on Form 10-K, as well as statements made by us in periodic press releases, oral statements made by our officials in the course of presentations about the Company and conference calls in connection with quarterly earnings releases, constitute “forward-looking statements” within the meaning of the Private Securities Litigation Reform Act of 1995. These forward-looking statements include statements regarding our business, financial condition, results of operation, cash flows, strategies and prospects. These forward-looking statements may be identified by terminology such as “likely,” “may,” “will,” “should,” “expects,” “plans,” “anticipates,” “believes,” “estimates,” “predicts,” “potential” or “continue,” or the negative of such terms and other comparable terminology. Although we believe that the expectations reflected in the forward-looking statements contained in this Report are reasonable, we cannot guarantee future results. These statements involve known and unknown risks, uncertainties and other factors that may cause the actual results, performance or achievements of the Company to be materially different from those expressed or implied by the forward-looking statements. We undertake no obligation to publicly update any forward-looking statements, whether as a result of new information, future events or otherwise. However, any further disclosures made on related subjects in subsequent reports on Forms 10-K, 10-Q and 8-K should be considered. M.D.C. Holdings, Inc. is a Delaware corporation. We refer to M.D.C. Holdings, Inc. as the “Company,” “MDC,” “we” or “our” in this Annual Report on Form 10-K, and these designations include our subsidiaries unless we state otherwise. We have two primary operations, homebuilding and financial services. Our homebuilding operations consist of wholly owned subsidiary companies that generally purchase finished lots or develop lots to the extent necessary for the construction and sale primarily of single-family detached homes to first-time and first-time move-up homebuyers under the name “Richmond American Homes.” Our homebuilding operations are comprised of various homebuilding divisions that we consider to be our operating segments. For financial reporting, we have aggregated our homebuilding operating segments into reportable segments as follows: (1) West (includes operating segments located in Arizona, California, Nevada, Washington and Oregon); (2) Mountain (includes operating segments located in Colorado and Utah); and (3) East (includes operating segments located in the mid-Atlantic, which includes Virginia and Maryland, and Florida). Our financial services operations primarily consist of (1) HomeAmerican Mortgage Corporation (“HomeAmerican”), which originates mortgage loans primarily for our homebuyers, (2) Allegiant Insurance Company, Inc., A Risk Retention Group (“Allegiant”), which provides insurance coverage primarily to our homebuilding subsidiaries on homes that have been delivered and most of our subcontractors for completed work on those delivered homes, (3) StarAmerican Insurance Ltd., which is a re-insurer of Allegiant claims, (4) American Home Insurance Agency, Inc., which offers third-party insurance products to our homebuyers, and (5) American Home Title and Escrow Company, which provides title agency services to our homebuilding subsidiaries and our customers in certain states. For financial reporting, we have aggregated our financial services operating segments into reportable segments as follows: (1) mortgage operations (represents HomeAmerican only) and (2) other (all remaining operating segments). We make our Annual Report on Form 10-K, Quarterly Reports on Form 10-Q, Current Reports on Form 8-K and amendments to those reports filed or furnished pursuant to Section 13(a) or 15(d) of the Securities Exchange Act of 1934, available free of charge on our website as soon as reasonably practicable after we file or furnish the materials electronically with the Securities and Exchange Commission (“SEC”). To obtain any of this information, go to our website, www.mdcholdings.com, and select “SEC Filings” from the “Financial Reports” menu. Our website includes our: (1) Corporate Governance Guidelines; (2) Corporate Code of Conduct; (3) Rules for Senior Financial Officers; (4) Audit Committee Procedures for Handling Confidential Complaints; and (5) charters for the Audit, Compensation, Legal and Corporate Governance/Nominating Committees. These materials may also be obtained, free of charge, at www.mdcholdings.com (select “Governance”). Our business consists of two primary operations, homebuilding and financial services. Our homebuilding subsidiaries build and sell primarily single-family detached homes that are designed and built to meet local customer preferences. Each homebuilding subsidiary is the general contractor for its projects and retains subcontractors for land development and home construction. Our homebuilding subsidiaries build a variety of home styles in each of their markets, targeting primarily first-time and first-time move-up homebuyers. Our financial services operations include subsidiaries that provide mortgage financing, place title insurance and homeowner insurance for our homebuyers, and provide general liability insurance for our subsidiaries and most of our subcontractors. Operating Divisions. The primary functions of our homebuilding segments include land acquisition and development, home construction, sales and marketing, and customer service. Operating decisions are made by our local management teams under the oversight of our Chief Operating Decision Maker (“CODM”), or decision-making group, defined as two key executives - our Chief Executive Officer and Chief Operating Officer. Our organizational structure (i.e., the grouping and reporting of divisions) changes based upon the current needs of the Company. We had 15, 15 and 13 active homebuilding operating divisions at the end of each year ended December 31, 2018, 2017 and 2016, respectively. review of capital allocation decisions. Housing. Generally, our homebuilding subsidiaries build single-family detached homes in a number of standardized series, designed to provide variety in the size and style of homes for our potential homebuyers. In certain markets, our homebuilding subsidiaries build and sell attached townhomes. Within each series of our single-family detached homes, our homebuilding subsidiaries build several different floor plans offering standard and optional features (such as upgraded appliances, cabinetry, flooring, etc.). Differences in sales prices of similar models from market-to-market depend primarily upon homebuyer demand, home prices offered by our competitors, market conditions (such as home inventory supply levels), location, cost of land, optional features and design specifications. The series of homes offered at a particular location is based on perceived customer preferences, lot size, area demographics and, in certain cases, the requirements of major land sellers and local municipalities. In general, our homebuilding subsidiaries focus on selling “to be built homes,” also referred to as “dirt sales,” and limit the number of homes started without a contract. Land Acquisition and Development. Our homebuilding subsidiaries acquire lots with the intention of constructing and selling homes on the acquired land. Generally, we prefer to purchase finished lots using option contracts, in phases or in bulk for cash. However, because there often is significant competition for finished lots, approximately one-half of the lots we purchase require some level of development. In making land purchases, we consider a number of factors, including projected rates of return, estimated gross margins from home sales, sales prices of the homes to be built, mortgage loan limits within the respective county, population and employment growth patterns, proximity to developed areas, estimated cost and complexity of development including environmental and geological factors, quality of schools, estimated levels of competition and demographic trends. In their option contracts, our homebuilding subsidiaries generally obtain the right to purchase lots in consideration for an option deposit in the form of cash or letters of credit. In the event they elect not to purchase the lots within a specified period of time, they may be required to forfeit the option deposit. Our option contracts do not contain provisions requiring our specific performance. Our homebuilding subsidiaries may own or have the right under option contracts to acquire undeveloped parcels of real estate that they intend to develop into finished lots. They generally develop our land in phases in order to limit our risk in a particular subdivision and to efficiently employ available capital resources. Generally, building permits and utilities are available and zoning is suitable for the current intended use of substantially all of our undeveloped land. When developed, these lots generally will be used in our homebuilding activities. See “Forward-Looking Statements” above. Labor and Raw Materials. Materials used in our homebuilding operations are mainly standard items carried by major suppliers. We generally contract for our materials and labor at a fixed price for the anticipated construction period of our homes. This allows us to mitigate the risks associated with increases in the cost of building materials and labor between the time construction begins on a home and the time it is closed. Increases in the cost of building materials and subcontracted labor may reduce gross margins from home sales to the extent that market conditions prevent the recovery of increased costs through higher home sales prices. From time to time and to varying degrees, we may experience shortages in the availability of building materials and/or labor in each of our markets. These shortages and delays may result in delays in the delivery of homes under construction, reduced gross margins from home sales, or both. See “Forward-Looking Statements” above. Warranty. Our homebuilding subsidiaries sell their homes with limited third-party warranties that generally provide for ten years of structural coverage, two years of coverage for plumbing, electrical, heating, ventilation and air conditioning systems, and one year of coverage for workmanship and materials. Under our agreement with the issuer of the third-party warranties, our homebuilding subsidiaries perform all of the work for the first two years of the warranty coverage and pay for substantially all of the work required to be performed during years three through ten of the warranties. Backlog. At December 31, 2018 and 2017, homes under contract but not yet delivered (“backlog”) totaled 2,936 and 3,159, respectively, with an estimated sales value of $1.43 billion and $1.60 billion, respectively. We anticipate that homes in backlog at December 31, 2018 generally will close during 2019 under their existing home order contracts or through the replacement of an existing contract with a new home order contract. The estimated backlog sales value at December 31, 2018 may be impacted by, among other things, subsequent home order cancellations, incentives provided, and/or options and upgrades selected. See “Forward-Looking Statements” above. Customer Service and Quality Control. Our homebuilding divisions are responsible for pre-closing quality control inspections and responding to customers’ post-closing needs. We have a product service and quality control program, focused on improving and/or maintaining the quality of our customers’ complete home buying and homeownership experience. Sales and Marketing. Our sales and marketing programs are designed to attract homebuyers in a cost effective manner. We have a centralized in-house advertising and marketing department, including digital marketing, that oversees our efforts to communicate the inherent value of our homes to our prospective homebuyers and distinguish our Richmond American Homes brand from our competitors or other home buying opportunities. The main objective of this team is to generate homebuyer leads, which are actively pursued by our community sales associates. Our centralized in-house merchandising team furnishes our model homes and sales offices. Another important part of our marketing presentation takes place in our design centers (also known as Home Galleries). Here, homebuyers are able to personalize their homes with a variety of options and upgrades. These locations also serve as an information center for prospective homebuyers and real estate agents who may opt to receive personalized attention from one of our new home specialists, resulting in a more focused and efficient home search across all of our Richmond American communities in a given market place. We believe that the services provided by our Home Galleries represent a key competitive advantage in attracting and retaining prospective homebuyers. Competition. The homebuilding industry is fragmented and highly competitive. The competitive nature of our business is described in more detail in our description of Risk Factors. Regulation. Our homebuilding operations are subject to compliance with applicable laws and regulations, which are described in more detail in our description of Risk Factors. General. HomeAmerican is a full-service mortgage lender and the principal originator of mortgage loans for our homebuyers. HomeAmerican has a centralized loan processing center where it originates mortgage loans, primarily for our homebuyers. HomeAmerican is authorized to originate Federal National Mortgage Association (“Fannie Mae”), Federal Home Loan Mortgage Corporation (“Freddie Mac”) (together “the government-sponsored enterprises”), Federal Housing Administration-insured (“FHA”), and Department of Veterans Affairs-guaranteed (“VA”) mortgages and is an authorized issuer of Government National Mortgage Association (“Ginnie Mae”) mortgage-backed securities. Furthermore, HomeAmerican also is an authorized loan servicer for Fannie Mae, Freddie Mac and Ginnie Mae and, as such, is subject to the rules and regulations of these entities. HomeAmerican uses a mortgage repurchase facility, internally generated funds, and temporary financing provided by its parent, to finance the origination of mortgage loans until they are sold. HomeAmerican sells originated mortgage loans to third-party purchasers on either a bulk or flow basis. Mortgage loans sold on a bulk basis include the sale of a package of substantially similar originated mortgage loans, while sales of mortgage loans on a flow basis are completed as HomeAmerican originates each loan. Mortgage loans sold to third-party purchasers include HomeAmerican’s representations and warranties with respect to certain borrower payment defaults, credit quality issues and/or misrepresentations made by HomeAmerican or our homebuyers. Substantially all of the mortgage loans originated by HomeAmerican are sold to third-party purchasers, generally between 10 to 35 days of origination. Pipeline. HomeAmerican’s mortgage loans in process for which a rate and price commitment had been made to a borrower that had not closed (the “locked pipeline”) at December 31, 2018 and 2017 had an aggregate principal balance of approximately $101.1 million and $66.6 million, respectively, and were under interest rate lock commitments at an average interest rate of 4.78% and 4.15%, respectively. Forward Sales Commitments. HomeAmerican is exposed to market risks related to fluctuations in interest rates. HomeAmerican creates certain derivative instruments in the normal course of business, which primarily include commitments to originate mortgage loans (interest rate lock commitments or locked pipeline). HomeAmerican uses forward sales of mortgage-backed securities and commitments from third-parties to purchase loans to hedge the interest rate risk inherent with the locked pipeline, as well as its loan inventory held for sale. The market related risks in our business are described in more detail in our description of Risk Factors. Competition. HomeAmerican has significant competition with other mortgage bankers to arrange financing for our homebuyers. However, in selling its originated mortgages to third parties, HomeAmerican has benefited from an increased number of smaller non-bank entities entering the third-party purchaser space, resulting in better prices and a potentially wider array of product options. The competitive nature of our mortgage business is described in more detail in our description of Risk Factors. Regulation. Our mortgage lending operations are subject to compliance with applicable laws and regulations, which are described in more detail in our description of Risk Factors. General. Allegiant and StarAmerican were formed to provide insurance coverage of homebuilding risks for our homebuilding subsidiaries and most of our homebuilding subcontractors. Allegiant was organized as a risk retention group under the Federal Liability Risk Retention Act of 1981. Allegiant, which began operations in June of 2004, is licensed as a Class 3 Stock Insurance Company by the Division of Insurance of the State of Hawaii and is subject primarily to the regulations of its state of incorporation. StarAmerican is a single parent captive insurance company licensed by the Division of Insurance of the State of Hawaii. Pursuant to agreements executed on an annual basis since June of 2004, StarAmerican has re-insured Allegiant for all claims in excess of $50,000 per occurrence up to $3.0 million per occurrence, subject to various aggregate limits. Allegiant generates premium revenue generally by providing to its customers, comprised of the Company’s homebuilding subsidiaries and most subcontractors of the Company’s homebuilding subsidiaries, general liability insurance on homes sold by our homebuilding subsidiaries and for work performed in completed subdivisions. Allegiant seeks to provide to its customers coverage and insurance rates that are competitive with other insurers. StarAmerican generates premium revenue by providing re-insurance coverage to Allegiant. Allegiant and StarAmerican incur expenses for actual losses and loss adjustment expenses and for reserves established based on actuarial studies including known facts, such as our experience with similar insurance cases and historical trends involving insurance claim payment patterns, pending levels of unpaid insurance claims, claim severity, claim frequency patterns and interpretations of circumstances including changing regulatory and legal environments. Regulation. Allegiant and StarAmerican are licensed in the State of Hawaii and, therefore, are subject to regulation by the Hawaii Insurance Division. This regulation includes restrictions and oversight regarding: types of insurance provided; investment options; required capital and surplus; financial and information reporting; use of auditors, actuaries and other service providers; periodic examinations; and other operational items. Additionally, as a risk retention group, Allegiant is also registered in other states where certain MDC homebuilding subsidiaries do business. American Home Insurance is an insurance agency that sells primarily homeowners’ personal property and casualty insurance products in the same markets where our homebuilding subsidiaries operate and primarily to our homebuyers. American Home Title provides title agency services to the Company and its homebuyers in Colorado, Florida, Maryland, Nevada and Virginia. The table below summarizes the approximate number of employees for our combined Homebuilding, combined Financial Services and Corporate segments at December 31, 2018 and 2017. Changes in general economic, real estate and other business conditions may have an adverse effect on the homebuilding and mortgage industries, which could have a negative impact on our business. These conditions may exist on a national level or may affect some of the regions or markets in which we operate more than others. When adverse conditions affect any of our larger markets, they could have a proportionately greater impact on us than on some other homebuilding companies. Changes to monetary policy or other actions by the Federal Reserve could have an adverse effect on interest rates (including mortgage interest rates), equity markets and consumer confidence. Such effects could cause us to experience declines in the market value of our inventory and the demand for our homes, resulting in a negative impact to our financial position, results of operations and cash flows. An oversupply of alternatives to new homes, including foreclosed homes, homes held for sale by investors and speculators, other existing homes, and rental properties, can also reduce our ability to sell new homes, depress new home prices and reduce our margins on the sale of new homes. High levels of foreclosures and short-sales not only contribute to additional inventory available for sale, but also can reduce appraisal valuations for new homes, potentially resulting in lower sales prices. Terrorist attacks, acts of war, other acts of violence or threats to national security, and any corresponding response by the United States or others, or related domestic or international instability, may adversely affect general economic conditions or cause a slowdown of the economy. As a result of the foregoing matters, potential customers may be less willing or able to buy our homes. In the future, our pricing strategies may continue to be limited by market conditions. We may be unable to change the mix of our home offerings, reduce the costs of the homes we build or offer more affordable homes to maintain our gross margins or satisfactorily address changing market conditions in other ways. In addition, cancellations of home sales contracts in backlog may increase as homebuyers choose to not honor their contracts. Additionally, the factors discussed above may increase our counterparty risk, which may include, among others, banks under our credit facilities and mortgage purchasers who may not be willing or able to perform on obligations to us. To the extent a third-party is unable or unwilling to meet its obligations, our financial position, results of operations and cash flows could be negatively impacted. Our mortgage operations are closely related to our homebuilding business, as HomeAmerican originates mortgage loans principally to purchasers of the homes we build. Therefore, a decrease in the demand for our homes because of the preceding matters may also adversely affect the financial results of this segment of our business. Furthermore, any adverse changes in the economic conditions discussed previously could increase the default rate on the mortgages we originate, which may adversely affect our ability to sell the mortgages, the pricing we receive upon the sale of mortgages, or our potential exposure to recourse regarding mortgage loan sales. These challenging conditions are complex and interrelated. We cannot predict their occurrence or severity, nor can we provide assurance that our responses would be successful. Increased competition levels in the homebuilding and mortgage lending industries could have a negative impact on our homebuilding and mortgage operations. The homebuilding industry is fragmented and highly competitive. Our homebuilding subsidiaries compete with numerous public and private homebuilders, including a number that are substantially larger than us and may have greater financial resources than we do. Our homebuilding subsidiaries also compete with subdivision developers and land development companies, some of which are themselves homebuilders or affiliates of homebuilders. Homebuilders compete for customers, land, building materials, subcontractor labor and desirable financing. Competition for home orders is based primarily on home sales price, location of property, home style, financing available to prospective homebuyers, quality of homes built, customer service and general reputation in the community, and may vary market-by-market and/or submarket-by-submarket. Additionally, competition within the homebuilding industry can be impacted by an excess supply of new and existing homes available for sale resulting from a number of factors, including, among other things, increases in the number of new home communities, increases in speculative homes available for sale and increases in home foreclosures. Increased competition can result in a decrease in our net new home orders, a decrease in our home sales prices and/or an increase in our home sales incentives in an effort to generate new home sales and maintain homes in backlog until they close. These competitive pressures may negatively impact our financial position, results of operations and cash flows. Our mortgage lending subsidiary, HomeAmerican, experiences competition from numerous banks and other mortgage bankers and brokers, many of which are larger and may have greater financial resources. As a result, these competitors may be able to offer better pricing and/or mortgage loan terms, more relaxed underwriting criteria and a greater range of products, which could negatively impact the financial position, results of operations and cash flows of our mortgage operations. If land is not available at reasonable prices or terms, we could be required to scale back our operations in a given market and/or we may operate at lower levels of profitability. Our operations depend on our homebuilding subsidiaries’ ability to obtain land for the development of our residential communities at reasonable prices and with terms that meet our underwriting criteria. Our ability to obtain land for new residential communities may be adversely affected by changes in the general availability of land, the willingness of land sellers to sell land at reasonable prices, competition for available land, availability of financing to acquire land, zoning, regulations that limit housing density, and other market conditions. If the supply of land, and especially finished lots, appropriate for development of residential communities is limited because of these factors, or for any other reason, the number of homes that our homebuilding subsidiaries build and sell may decline. To the extent that we are unable to purchase land timely or enter into new contracts for the purchase of land at reasonable prices, due to the lag time between the time we acquire land and the time we begin selling homes, we may be required to scale back our operations in a given market and/or we may operate at lower levels of profitability. As a result, our financial position, results of operations and cash flows could be negatively impacted. The residential construction industry experiences price fluctuations and shortages in labor and materials from time to time. Shortages in labor can be due to: work stoppages, labor disputes, shortages in qualified trades people, lack of availability of adequate utility infrastructure and services, or our need to rely on local subcontractors who may not be adequately capitalized or insured. Labor and material shortages can be more severe during periods of strong demand for housing or during periods in which the markets where we operate experience natural disasters that have a significant impact on existing residential and commercial structures. Additionally, we could experience labor shortages as a result of subcontractors going out of business or leaving the residential construction market due to low levels of housing production and volumes. Pricing for labor and materials can be affected by the factors discussed above, changes in energy prices, and various other national, regional and local economic factors. Recalls of materials driven by manufacturing defects can drive shortages in materials and delay the delivery of homes. Any of these circumstances could give rise to delays in the start or completion of our residential communities, increase the cost of developing one or more of our residential communities and/or increase the construction cost of our homes. We generally are unable to pass on increases in construction costs to customers who have already entered into sales contracts, as those sales contracts fix the price of the homes at the time the contracts are signed, which generally is in advance of the construction of the home. To the extent that market conditions prevent the recovery of increased costs, including, among other things, subcontracted labor, finished lots, building materials, and other resources, through higher selling prices, our financial position, cash flows and operating results, including our gross margin from home sales, could be negatively impacted. If mortgage interest rates rise, if down payment requirements are increased, if loan limits are decreased, or if mortgage financing otherwise becomes less available, it could adversely affect our business. Mortgage liquidity influenced by governmental entities like the FHA, VA, USDA and Ginnie Mae or government-sponsored enterprises (“GSEs”) like Fannie Mae and Freddie Mac continue to be an important factor in marketing our homes. Financial losses or other factors may limit, restrict or otherwise curtail their ability or willingness to insure mortgage loans, offer insurance at rates and on terms that are not prohibitive, or purchase mortgage loans. Should this occur, it may negatively impact the availability of mortgage financing and our sales of new homes. We believe that the liquidity provided by Fannie Mae, Freddie Mac and Ginnie Mae to the mortgage industry has been very important to the housing market. The future of Fannie Mae and Freddie Mac are in question and any reduction in the availability of the liquidity provided by these institutions could adversely affect interest rates, mortgage availability and our sales of new homes and mortgage loans. Loans sold to or insured by the GSEs are subject to various loan limits. Decreases in these loan limits may require homebuyers to make larger down payments or obtain more restrictive non-conforming or “jumbo” mortgages, which could adversely impact on our financial position, results of operations and cash flows. Even if potential customers do not need financing, changes in the availability of mortgage products may make it harder for them to sell their current homes to potential buyers who need financing. If interest rates increase, the costs of owning a home may be affected and could result in further reductions in the demand for our homes. Changes to tax laws, incentives or credits currently available to our customers may negatively impact our business. Many homeowners receive substantial tax benefits in the form of tax deductions against their personal taxable income for mortgage interest and property tax payments and the loss or reduction of these deductions could affect homeowners’ net cost of owning a home. On December 22, 2017, the Tax Cuts and Jobs Act of 2017 was enacted. As a result of the Tax Cuts and Jobs Act, substantial changes were made to personal income tax rates and the deductibility of (1) mortgage interest, (2) state and local taxes and (3) real property taxes, among other items. The full impact of these changes is still unknown. However, the changes resulting from the Tax Cuts and Jobs Act, in addition to any other future changes to existing tax laws, may result in an increase in the total cost of home ownership and may make the purchase of a home less attractive to buyers. This could adversely impact demand for and/or sales prices of new homes, which would have a negative impact on our business. A decline in the market value of our homes or carrying value of our land would have a negative impact on our business. Our homebuilding subsidiaries acquire land for the replacement of land inventory and/or expansion within our current markets and may, from time to time, purchase land for expansion into new markets. The fair value of our land and land under development inventory and housing completed or under construction inventory depends on market conditions. Factors that can impact our determination of the fair value of our inventory primarily include home sale prices, levels of home sale incentives and home construction and land costs. Our home sale prices and/or levels of home sale incentives can be impacted by, among other things, uncertainty in the homebuilding and mortgage industries or the United States/global economy overall, decreased demand for new homes, decreased home prices offered by our competitors, home foreclosure and short-sale levels, decreased ability of our homebuyers to obtain suitable mortgage loan financing and high levels of home order cancellations. Under such circumstances, we may be required to record impairments of our inventory. Any such inventory impairments would have a negative impact on our financial position and results of operations. Natural disasters could cause an increase in home construction costs, as well as delays, and could negatively impact our business. The climates and geology of many of the markets in which we operate present increased risks of natural disasters. To the extent that hurricanes, severe storms, earthquakes, droughts, floods, heavy or prolonged precipitation, wildfires or other natural disasters or similar events occur, the financial position, results of operations and cash flows of our business may be negatively impacted. Changes in energy prices or regulations may have an adverse effect on our cost of building homes. Some of the markets in which we operate are impacted by regulations related to energy, such as setbacks required from oil / gas drilling operations or restrictions on the use of land. To the extent that these regulations are modified, the value of land we already own or the availability of land we are looking to purchase may decline, which may adversely impact the financial position, results of operations and cash flows of our business. Furthermore, pricing offered by our suppliers and subcontractors can be adversely affected by increases in various energy costs resulting in a negative impact to our financial position, results of operations and cash flows of our business. We have financial needs that we meet through the capital markets, including the debt and secondary mortgage markets, and disruptions in these markets could have an adverse impact on the results of our business. We have financial needs that we meet through the capital markets, including the debt and secondary mortgage markets. Our requirements for additional capital, whether to finance operations or to service or refinance our existing indebtedness, fluctuate as market conditions and our financial performance and operations change. We cannot provide assurance that we will maintain cash reserves and generate sufficient cash flow from operations in an amount to enable us to service our debt or to fund other liquidity needs. The availability of additional capital, whether from private capital sources or the public capital markets, fluctuates as our financial condition and market conditions in general change. There may be times when the private capital markets and the public debt or equity markets lack sufficient liquidity or when our securities cannot be sold at attractive prices, in which case we would not be able to access capital from these sources. Additionally, any reduction in our credit rankings and/or a weakening of our financial condition, could adversely affect our ability to obtain necessary funds. Even if financing is available, it could be costly or have other adverse consequences. In addition, the sources and terms and conditions of our mortgage repurchase facility are subject to change. These changes may impact, among other things, availability of capital, cost of borrowings, collateral requirements and collateral advance rates. Our business is subject to numerous federal, state and local laws and regulations concerning land development, construction of homes, sales, mortgage lending, environmental and other aspects of our business. These laws and regulations could give rise to additional liabilities or expenditures, or restrictions on our business. Our operations are subject to continuing compliance requirements mandated by applicable federal, state and local statutes, ordinances, rules and regulations, including zoning and land use ordinances, building, plumbing and electrical codes, contractors’ licensing laws, state insurance laws, federal and state human resources laws and regulations, and health and safety laws and regulations. Various localities in which we operate have imposed (or may impose in the future) fees on developers to fund schools, road improvements and low and moderate-income housing. Availability of and costs related to permit, water/sewer tap, and impact fees can impact our homebuilding operations. From time to time, various municipalities in which our homebuilding subsidiaries operate restrict or place moratoria on the availability of utilities, including water and sewer taps. Additionally, certain jurisdictions in which our homebuilding subsidiaries operate have proposed or enacted “slow growth” or “no growth” initiatives and other measures that may restrict the number of building permits available in any given year. These initiatives or other similar measures could reduce our ability to open new subdivisions and build and sell homes in the affected markets. The availability issues previously discussed and any increases in costs of these fees may negatively impact our financial position, results of operations and cash flows. Our homebuilding operations also are affected by environmental laws and regulations pertaining to availability of water, municipal sewage treatment capacity, stormwater discharges, land use, hazardous waste disposal, dust controls, building materials, population density and preservation of endangered species, natural terrain and vegetation. The particular environmental laws and regulations that apply to any given homebuilding project vary greatly according to a particular site’s location, the site’s environmental conditions and the present and former uses. These environmental laws may result in project delays, cause us to incur substantial compliance and other costs and/or prohibit or severely restrict homebuilding activity in certain environmentally sensitive locations. Environmental laws and regulations may also have a negative impact on the availability and price of certain raw materials, such as lumber. We also are subject to rules and regulations with respect to originating, processing, selling and servicing mortgage loans, which, among other things: prohibit discrimination and establish underwriting guidelines; provide for audits and inspections; require appraisals and/or credit reports on prospective borrowers and disclosure of certain information concerning credit and settlement costs; establish maximum loan amounts; prohibit predatory lending practices; and regulate the referral of business to affiliated entities. The regulatory environment for mortgage lending is complex and ever changing and has led to an increase in the number of audits and examinations in the industry. These examinations can include consumer lending practices, sales of mortgages to financial institutions and other investors and the practices in the financial services segments of homebuilding companies. New rules and regulations or revised interpretations of existing rules and regulations applicable to our mortgage lending operations could result in more stringent compliance standards, which may substantially increase costs of compliance. In the ordinary course of business, we are required to obtain surety bonds, the unavailability of which could adversely affect our business. As is customary in the homebuilding industry, we often are required to provide surety bonds to secure our performance under construction contracts, development agreements and other arrangements. Our ability to obtain surety bonds primarily depends upon our credit rating, capitalization, working capital, past performance, management expertise and certain external factors, including the overall capacity of the surety market and the underwriting practices of surety bond issuers. The ability to obtain surety bonds also can be impacted by the willingness of insurance companies to issue surety bonds. If we are unable to obtain surety bonds when required, our financial position, results of operations and cash flows could be adversely impacted. Decreases in the market value of our investments in marketable securities could have an adverse impact on our business. We have a significant amount of investments in marketable securities, the market value of which is subject to changes from period to period. Decreases in the market value of our marketable securities could have an adverse impact on our financial position, results of operations and cash flows. Product liability litigation and warranty claims that arise in the ordinary course of business may be costly. As a homebuilder, we are subject to construction defect and home warranty claims, as well as claims associated with the sale and financing of our homes arising in the ordinary course of business. These types of claims can be costly. The costs of insuring against or directly paying for construction defect and product liability claims can be high and the amount of coverage offered by insurance companies may be limited. If we are not able to obtain adequate insurance against these claims, we may incur additional expenses that would have a negative impact on our results of operations in future reporting periods. Additionally, changes in the facts and circumstances of our pending litigation matters could have a material impact on our financial position, results of operations and cash flows. Repurchase requirements associated with HomeAmerican’s sale of mortgage loans, could negatively impact our business. We are subject to risks associated with mortgage loans, including conventional mortgage loans, FHA and VA mortgage loans, second mortgage loans, high loan-to-value mortgage loans and jumbo mortgage loans (mortgage loans with principal balances that exceed various thresholds in our markets). These risks may include, among other things, compliance with mortgage loan underwriting criteria and the associated homebuyers’ performance, which could require HomeAmerican to repurchase certain of those mortgage loans or provide indemnification. Repurchased mortgage loans and/or the settlement of claims associated with such loans could have a negative impact on HomeAmerican’s financial position, results of operations and cash flows. Because of the seasonal nature of our business, our quarterly operating results can fluctuate. We may experience noticeable seasonality and quarter-to-quarter variability in homebuilding activity levels. In general, the number of homes delivered and the associated home sale revenues increase during the third and fourth quarters, compared with the first and second quarters. We believe that this type of seasonality reflects the historical tendency of homebuyers to purchase new homes in the spring and summer with deliveries scheduled in the fall or winter, as well as the scheduling of construction to accommodate seasonal weather conditions in certain markets. We are dependent on the services of key employees, and the loss of their services could hurt our business. Although we believe that we have made provision for adequately staffing current operations, because of competition for experienced homebuilding industry personnel, retaining our skilled people is an important area of focus. Our future success depends, in part, on our ability to attract, train and retain skilled personnel. If we are unable to retain our key employees or attract, train and retain other skilled personnel in the future, it could have an adverse impact on our financial position, results of operations and cash flows. Larry A. Mizel and David D. Mandarich beneficially own, directly or indirectly through their affiliates, in the aggregate, approximately 25% of our common stock. To the extent they and their affiliates vote their shares in the same manner, their combined stock ownership may effectively give them the power to influence the election of members of our board of directors and other matters reserved for our shareholders. We use information technology and other computer resources to carry out important operational activities and to maintain our business records. These information technology systems are dependent upon electronic systems and other aspects of the internet infrastructure. A material breach in the security of our information technology systems or other data security controls could result in third parties obtaining or corrupting customer, employee or company data. Such occurrences could have a material and adverse effect on our financial position, results of operations and cash flows. Our corporate office is located at 4350 South Monaco Street, Denver, Colorado 80237, where we lease all 144,000 square feet of office space in the building. In many of our markets, our homebuilding divisions and other MDC subsidiaries lease additional office space. While we are currently satisfied with the suitability and capacity of our office locations to meet our current business needs, we continue to evaluate them in view of market conditions and the size of our operations. Because of the nature of the homebuilding business, we and certain of our subsidiaries and affiliates have been named as defendants in various claims, complaints and other legal actions arising in the ordinary course of business, including product liability claims and claims associated with the sale and financing of our homes. In the opinion of management, the outcome of these ordinary course matters will not have a material adverse effect upon our financial condition, results of operations or cash flows. At December 31, 2018, we had 565 shareholders of record. The shares of our common stock are traded on the New York Stock Exchange under the trading symbol MDC. On November 21, 2017, the Company announced an 8% stock dividend that was distributed on December 19, 2017 to shareholders of record on December 5, 2017. On November 22, 2016, the Company announced a 5% stock dividend that was distributed on December 20, 2016 to shareholders of record on December 6, 2016. In accordance with Accounting Standards Codification Topic 260, “Earnings per Share”, basic and diluted earnings per share amounts, weighted-average shares outstanding, and dividends declared per share have been restated for all periods presented to reflect the effect of these stock dividends. The table below sets forth the cash dividends declared and paid in 2018, 2017 and 2016. On January 28, 2019, the Company declared a cash dividend of $0.30 per share as well as an 8% stock dividend. The cash dividend will be payable February 27, 2019 to shareholders of record on February 13, 2019. The stock dividend will be distributed on February 28, 2019 to shareholders of record on February 14, 2019, with a brokers’ cut-off date of February 21, 2019, and will be in the form of one additional share of MDC common stock for each 12.5 shares owned by shareholders on the record date. Cash will be paid in lieu of fractional shares based on the closing price of MDC’s common stock on the record date. There were no shares of MDC common stock repurchased during the years ended December 31, 2018, 2017 or 2016. At December 31, 2018, we were authorized to repurchase up to 4,000,000 shares of our common stock. 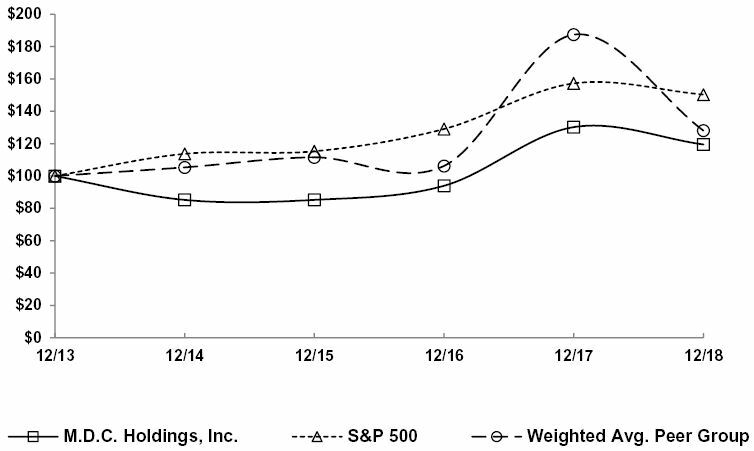 Set forth below is a graph comparing the yearly change in the cumulative total return of MDC's common stock with the cumulative total return of the Standard & Poor's 500 Stock Index and with that of a peer group of other homebuilders over the five-year period ended December 31, 2018, weighted as of the beginning of that period. It is assumed in the graph that $100 was invested (1) in our common stock; (2) in the stocks of the companies in the Standard & Poor’s 500 Stock Index; and (3) in the stocks of the peer group companies, just prior to the commencement of the period and that all dividends received within a quarter were reinvested in that quarter. The peer group index is composed of the following companies: Beazer Homes USA, Inc., D.R. Horton, Inc., Hovnanian Enterprises, Inc., KB Home, Lennar Corporation, M/I Homes, Inc., Meritage Homes Corporation, NVR, Inc., Pulte Homes, Inc. and Toll Brothers, Inc. The stock price performance shown on the following graph is not indicative of future price performance. The data in these tables and related footnotes should be read in conjunction with "Management's Discussion and Analysis of Financial Condition and Results of Operations" and our Consolidated Financial Statements. During 2014, we redeemed our 5⅜% Senior Notes due December 2014 and our 5⅜% Senior Notes due July 2015. As a result of these transactions, we paid $517.7 million to extinguish $500 million in debt principal and recorded a total of $18.2 million in losses from early extinguishments of debt. During 2017, we realized a pretax gain of $53.6 million on investment sales. During 2017, we issued an additional $150.0 million of our 6.000% senior notes due January 2043 for net proceeds of $146.5 million. As a result of the stock dividends distributed during 2017 and 2016, the stockholders’ equity per common share amounts for the years ended December 31, 2016, 2015 and 2014 have been adjusted. For the year ended December 31, 2018, we reported net income of $210.8 million, or $3.66 per diluted share, a 49% increase compared to net income of $141.8 million, or $2.48 per diluted share, for the prior year period. The increase was primarily due to a 19% improvement in home sale revenues and a 170 basis point improvement in gross margin from home sales. Additionally, our net income benefited from a decrease in our effective tax rate primarily due to the Tax Cuts and Jobs Act that was signed into law in December 2017. These positive factors were partially offset by a $53.6 million decrease in realized investment gains within our Corporate segment as a result of the sale of metropolitan district bond securities and marketable securities in the prior year that did not recur in 2018. Home sale revenues were up from $2.50 billion in 2017 to $2.98 billion in 2018. The improvement was the result of a 12% increase in the number of homes delivered and a 7% increase in the average price of those homes. The higher revenues drove a 40 basis point decrease in our SG&A rate (see “Selling, General and Administrative Expenses” below). The dollar value of our net new home orders increased 3% from the prior year period, driven by slight increases in the number of average active communities and sales pace. Our monthly sales absorption pace for the full year ended December 31, 2018 was 3.16, which was our highest monthly absorption pace for a full year since 2005. In part, the increase in our monthly absorption rate was attributable to our more affordable product offerings such as our Seasons™ product, which accounted for 20% of our net new orders during 2018 compared to just 11% a year ago. Our financial services pretax income was $46.4 million for the year ended December 31, 2018, a 6% increase from $43.8 million for the year ended December 31, 2017. The increase in pretax income was due to a 12% increase in revenues driven by (1) increases in the dollar value of loans locked, originated and sold by our mortgage operations segment and (2) increases in insurance premiums collected and recognized on increased home closings. These increases were slightly offset by $3.7 million of net losses on equity securities recognized in 2018. The homebuilding industry continued to be supported by solid economic fundamentals throughout 2018, as low unemployment, higher wages and reasonably low new and existing home inventories helped drive our full year monthly absorption pace to the highest level in over a decade. There has been some recent homebuyer uncertainty with respect to the housing market, which was reflected in a 15% year-over-year decrease in our fourth quarter unit net orders, due in part to rising interest rates and higher home prices. However, we believe we are well positioned to capture market demand with our increasing focus on more affordable home plans, which accounted for 51% of all lots approved for purchase in 2018, and our increasingly distinct build-to-order model. Following the year-over-year decrease in our net orders during the fourth quarter, we ended 2018 with a backlog dollar value that was 11% lower than a year ago, which is a headwind for future growth. However, we remain optimistic for 2019 given the benefits afforded by our expanded affordable product offerings, including (1) the potential for a higher backlog conversion rate based on lower cycle times for these more affordable plans, and (2) the relatively strong demand we have seen for this product. Furthermore, our active subdivisions at the end of 2018 increased by 10% year-over-year, providing a tailwind as we enter the 2019 spring selling season. We are also encouraged by our average gross margin in backlog at December 31, 2018, which is comparable to the pre-impairment gross margin level we recognized from home closings during 2018. At the end of 2018, our financial position remained strong, as evidenced by an 18% year-over-year increase in our total liquidity to $1.48 billion, in large part due to the $300 million increase in our homebuilding line of credit to $1.0 billion during the fourth quarter of 2018. We believe that our financial position ranks among the best in the homebuilding industry and provides us with (1) a competitive advantage in responding to a variety of market conditions, and (2) a unique ability to sustain dividend payments through the cycles of the homebuilding industry. * See "Forward-Looking Statements" above. Homebuilding pretax income for 2018 was $217.5 million, an increase of $31.6 million from $185.9 million for the year ended December 31, 2017. The increase was primarily attributable to a 19% increase in home sale revenues and a 170 basis point improvement in gross margin from home sales, which was partially offset by a $53.6 million decrease in realized investment gains within our Corporate segment as a result of the sale of metropolitan district bonds securities and marketable securities in 2017 that did not recur in 2018. Our West Segment experienced a $49.1 million year-over-year improvement in pretax income, primarily due to an improved gross margin from home sales despite a year-over-year increase in inventory impairment of $13.1 million. Increased home sale revenues of 19% also contributed to higher pretax income in the West. Our Mountain segment experienced a $48.3 million year-over-year improvement in pretax income, primarily driven by a 35% increase in home sale revenues and an improved gross margin from home sales. Our Corporate segment experienced a $64.0 million decrease in pretax income from the prior year primarily as a result of the significant gains recognized on the sale of investments in 2017 that did not recur in 2018 as well as an increase in compensation-related general and administrative expenses. Homebuilding pretax income for 2017 was $185.9 million, an increase of $70.6 million from $115.4 million for the year ended December 31, 2016. The increase was primarily attributable to an 11% increase in home sale revenues, a 50 basis point improvement in gross margin from home sales and $53.6 million in realized gains due to the sales of investments held by our Corporate segment. The increases were slightly offset by a higher SG&A rate driven by compensation-related expenses that increased due to higher headcount. The year-over-year improvements in pretax income for our West and Mountain segments were driven primarily by higher home sale revenues of 17% and 7%, respectively. Pretax income was negatively impacted in our West segment as a result of a $4.6 million increase in impairments while pretax income was positively impacted in our Mountain segment by an improving gross margin from home sales. Our East segment had a $9.5 million improvement in pretax income primarily as a result of a $4.4 million reduction in inventory impairments. The pretax gain for our Corporate segment was driven by the realized gains on the sales of investments discussed above, partially offset by an increase in compensation-related expenses. Total homebuilding assets increased 7% from December 31, 2017 to December 31, 2018. Increases in both our West and Mountain segments were the result of increases in our inventory balances. These increases were driven by a greater number of lots acquired during 2018 as compared to 2017 and, to a lesser extent, homes completed or under construction as of year-end. The funds for this land acquisition and construction activity came from our Corporate segment, causing a decline in our Corporate segment’s assets. In addition, our East segment assets decreased due to a lower level of investment in our mid-Atlantic market over the past two years. However, as indicated by the 19% year-over-year increase in lots owned and optioned in our East segment, including a 72% year-over-year increase in our mid-Atlantic market, we have begun reinvesting in this market recently. Changes in home sale revenues are impacted by changes in the number of new homes delivered and the average selling price of those delivered homes. Commentary for each of our segments on significant changes in these two metrics is provided below. For the year ended December 31, 2018, we realized significant year-over-year percentage increases in the average selling price for each of our markets in the West segment due to price increases implemented throughout 2017 and continuing into the first half of 2018 and a shift in mix to higher priced communities. Our total new homes delivered were up 8% for the year ended December 31, 2018 due to an 8% year over year increase in the number of homes in backlog to start the year and strong net new order activity in our Arizona markets throughout 2018 resulting in increased deliveries in the second half of 2018. For the year ended December 31, 2018, our Mountain segment experienced a 25% year-over-year increase in the number of new homes delivered, as a result of a 17% increase in the number of homes in backlog to start the year and an increased backlog conversion rate in our Colorado markets due to a vendor related defect issue that negatively impacted our ability to close backlog in the second half of 2017. The average selling price of homes delivered for the year ended December 31, 2018 was up 8% as compared to the prior year as a result of price increases implemented throughout 2017 and continuing into the first half of 2018 and a shift in mix to higher priced communities. For the year ended December 31, 2018, the decrease in the average selling price of homes closed in our East segment is due to mix as a result of (1) a higher percentage of our deliveries coming from our Florida markets, which have a lower average selling price than our mid-Atlantic market and (2) a higher percentage of deliveries in this segment coming from communities that offer more affordable home plans. Home deliveries declined slightly year-over-year due to a 3% decrease in the number of homes in backlog to start the year, as well as an 11% decline in the number of net new orders in 2018 driven by a 24% year-over-year decline in the number of average active communities. For the year ended December 31, 2017, the year-over-year changes in homes delivered in most of our markets were primarily the result of the year-over-year change in the number of units in backlog to begin the year. In our Maryland and Virginia markets (East segment), while we started the year with beginning backlog units up from the prior year, our number of homes delivered was down primarily due to declines in the number of net new orders in the first part of 2017 as a result of reductions in community count. Our Washington (West segment) and Utah (Mountain segment) markets experienced the largest year-over-year increases in the average selling price of homes delivered due to a combination of price increases implemented in most communities coupled with a shift in mix to higher priced communities. In Colorado (Mountain segment), where we have experienced the most significant roll-out of our Seasons™ product line, we experienced a slight decrease in the average selling price of homes delivered. Our gross margin from home sales for the year ended December 31, 2018 increased 170 basis points year-over-year from 16.6% to 18.3%. The improvement in gross margin from home sales was primarily driven by improving gross margins across most of our markets as a result of favorable supply / demand dynamics, which gave us the ability to increase pricing in the majority of our selling communities. Our gross margin from home sales was also positively impacted by a higher percentage of our closings coming from our more affordable Seasons™ product, which had a higher average gross margin than our traditional new home plans, and a 40 basis point improvement in our interest in cost of sales as a percentage of home sale revenues. During the years ended December 31, 2018 and 2017, we recorded inventory impairments of $21.9 million and $10.0 million, respectively. The impairments recorded for each year negatively impacted gross margin by 70 basis points and 40 basis points, respectively. See below for further discussion of the inventory impairments. Our gross margin from home sales for the year ended December 31, 2017 increased 50 basis points year-over-year to 16.6%. The twelve months ended December 31, 2017 included $10.0 million of inventory impairments (a 40 basis point negative impact to gross margin) and $1.3 million of adjustments to increase our warranty accrual (a 10 basis point negative impact to gross margin), while the same period in 2016 included $10.2 million of inventory impairments (a 50 basis point negative impact to gross margin) and $7.5 million of adjustments to increase our warranty accrual (a 30 basis point negative impact to gross margin percentage). The warranty adjustments were primarily due to an unexpected increase in warranty related expenditures, which began during the second half of 2015 and continued, to a lesser extent, through 2017. During the year ended December 31, 2018, we recorded $21.9 million of inventory impairments, of which $19.1 million related to seven projects in our West segment, $1.4 million related to five projects in our East segment and $1.4 million related to three projects in our Mountain segment. The majority of the impairment for 2018 related to two communities. During the third quarter of 2018, a single community in one of our California markets accounted for $10.8 million of the total impairment charge recorded during the period. This was a unique subdivision with homes at an above average price point as compared to the local market. During the fourth quarter of 2018, a single community in our Oregon market accounted for $7.3 million of the total impairment charge recorded during the period. This was our first community acquired and opened in our Oregon market, and it was negatively impacted by slower than expected sales at a higher than average price point as compared to the local market. Additionally, the subdivision incurred unexpected costs as we had not previously built homes in the Oregon market. During the year ended December 31, 2017, we recorded $10.0 million of inventory impairments, of which $6.0 million related to four projects in our West segment, $3.2 million related to five projects in our East segment and $0.8 million related to one project in our Mountain segment. During the year ended December 31, 2016, we recorded $10.2 million of inventory impairments, of which $7.6 million related to five projects in our East segment, $1.4 million related to one project in our West segment and $1.2 million related to one project in our Mountain segment. Inventory impairments recognized by segment for the years ended December 31, 2018, 2017 and 2016 are shown in the table below. The table below provides quantitative data, for the periods presented, used in determining the fair value of the impaired inventory. For the year ended December 31, 2018, our SG&A expenses increased $42.3 million to $329.8 million, while our SG&A rate improved by 40 basis points year-over year. The improvement in our SG&A rate was driven primarily by an increased ability to leverage our fixed overhead to support our 19% increase in home sale revenues. This improved leverage was somewhat diminished by higher compensation-related expense due to increased headcount as well as a $6.6 million increase in stock-based compensation expense associated with performance-based stock awards that were granted in 2016 and 2017. For the year ended December 31, 2017, our SG&A expenses increased $36.9 million to $287.5 million, resulting in a year-over-year increase in our SG&A rate of 40 basis points. The increase in our SG&A rate was driven primarily by higher compensation-related expenses due to increased headcount. Our realized gains from the sales of marketable securities for the twelve months ended December 31, 2018, 2017 and 2016 were $0.0 million, $17.8 million and $1.0 million, respectively. The year-over-year increase for the twelve months ended December 31, 2017 was related to the sale of all of our marketable equity securities. During the year ended December 31, 2017, we sold our metropolitan district bond securities for net proceeds of $44.3 million. With a cost basis of $8.4 million, we recorded a realized gain of $35.8 million. For the year ended December 31, 2018, our dollar value of net new orders increased 7% from the prior year, driven by a 7% increase in our number of net new orders. The increase in our number of net new orders was primarily due to an improved sales pace in Arizona and Nevada as these markets have seen especially strong demand dynamics. The increase in our sales pace in Arizona and Nevada was partially offset by a decline in our sales pace in California as a result of: (1) a smaller relative proportion of affordable product offerings currently available in this market and (2) a lower pace of gross sales (before cancellations) as (a) we increased prices throughout 2017 and continuing into the first half of 2018 in response to market demand, which allowed us to offset cost increases and improve gross margins, and (b) homebuyer uncertainty increased in the second half of 2018 amid increasing interest rates and higher home prices. For the year ended December 31, 2018, our dollar value of net new orders increased 6% year-over-year, due to a 2% increase in our number of net new orders and a 4% improvement in our average selling price. The increase in the average sales price is a result of price increases we have implemented throughout 2017 and continuing into the first half of 2018 in the majority of communities in this segment. Our higher number of net new orders was the result of a 15% increase in average active community count as a result of growth in Colorado. This increase was partially offset by a 14% decrease in our monthly sales absorption pace. Colorado was the main driver of the decline in our sales pace as a result of: (1) an increased cancellation rate (see further discussion below) and (2) a lower pace of gross sales (before cancellations) as (a) we increased prices throughout 2017 and continuing into the first half of 2018 as noted above in response to market demand, which allowed us to offset cost increases and improve gross margins, and (b) homebuyer uncertainty increased in the second half of 2018 amid increasing interest rates and higher home prices. For the year ended December 31, 2018, our dollar values of net new orders decreased 23% year-over-year, as declines in both our average selling price of net new orders (14%) and our average active community count (24%) were only slightly offset by a 17% improvement in our monthly sales absorption rate. The improved sales pace we realized was primarily due to an increased offering of more affordable products in our Florida markets, which have realized a higher selling pace, and strong order activity in the limited number of new communities we have opened in our mid-Atlantic market. Our average active community count was down mostly due to decreased land acquisition activity in the mid-Atlantic market over the past two years where we have invested less because our returns in this market had been lower than expected. However, as noted above, we have recently experienced improving returns in the mid-Atlantic region resulting in reinvestment in this market. The decrease in the average selling price of net new orders is due to mix as a result of: (1) a higher percentage of our net new orders coming from our Florida markets, which have a lower average selling price than our mid-Atlantic operations, and (2) a higher percentage of our net new orders coming from an expanded offering of more affordable home plans, due to an increasing level of demand for these plans. For the twelve months ended December 31, 2017, the dollar value of net new orders was up year-over-year as a slight increase in the average selling price of net new orders and a 9% improvement in our monthly sales absorption pace was partially offset by a lower average active community count. Every market in our West and Mountain segments had year-over-year improvements in the dollar value of net new orders and, with the exception of Colorado (Mountain segment), all of these markets experienced an improved monthly sales absorption pace mostly due to sound economic fundamentals driving solid demand for new homes. While most of these markets had year-over-year declines in average active community count, the strong improvement in monthly sales absorption pace, notably in our Arizona, Nevada and Washington markets (West segment), almost or completely offset the declines in average active communities. We saw the largest improvement in sales pace in our Washington market, which benefited from robust demand in newly opened communities. In our Colorado market, a 29% year-over-year increase in the number of average active subdivisions was partially offset by a lower monthly sales absorption pace that was negatively impacted by a number of factors including (1) a higher cancellation rate and lower sales pace in the 2nd half of 2017 as a result of the vendor related defect issue and (2) a higher number of sales coming from close-out (i.e. inactive) communities in 2016 compared to the same metric in 2017. In our East segment, each of our markets experienced a year-over-year decline in the dollar value of net new orders. Both of our Maryland and Virginia markets (East segment) experienced the most significant decreases in the number of new orders as a result of substantial declines in average activity community count. Our Florida market (East segment) experienced the most significant decline in average selling price of net new orders as a result of a shift in mix of sales to communities with lower selling prices. Our cancellations as a percentage of gross sales (“cancellation rate”) increased from 20% for the year ended December 31, 2017 to 24% for the year ended December 31, 2018. While our West segment experienced relatively consistent cancellation rates with prior years, our East and Mountain segments experienced a year-over-year increase in cancellation rates of 9% and 5%, respectively. This was primarily due to cancellations coming from our Florida and Colorado operations, where our mix has shifted to include more first time homebuyers who have a higher likelihood of cancellation. Overall, we experienced an increase in cancellations during the second half of 2018 as a result of homebuyer uncertainty with respect to the housing market amid rising interest rates and higher home prices. Consistent with our quarterly homebuilding operating data provided, we have also included below the cancellations as a percentage of homes in beginning backlog for each quarter during the years ended December 31, 2018 and 2017. At December 31, 2018, we had 2,936 homes in backlog with a total value of $1.43 billion, representing respective decreases of 7% and 11% from December 31, 2017. The year-over-year changes in each segment’s homes in backlog and average selling price are correlated with the year-over-year changes in net new orders with the exception of the Colorado and Arizona markets. Colorado (Mountain segment) was impacted by a vendor related defect issue that negatively impacted our ability to close backlog in the second half of 2017. Our Arizona markets (West segment) experienced a lower backlog conversion rate as compared to the prior year due to labor constraints driven by strong new home demand. While we continue to focus on our build-to-order model, there were certain markets in the last twelve months where we intentionally started construction on unsold lots in order to promote building efficiencies or to meet various municipal requirements. The increase in our total unsold started homes was also negatively impacted by the increased cancellation rates discussed above. Our model homes under construction or completed were up 20% despite our active community count being up only 10% year-over-year. This is primarily the result of models being constructed to open new communities in the near future as we plan for growth in our active community count. Our total owned and optioned lots at December 31, 2018 were 23,187, up 20% from December 31, 2017, due to our land acquisition approval activity over the past year across nearly all of our markets. We believe that our total lot supply can support growth in future periods. See "Forward-Looking Statements" above.